The Lake Constance break offered by Newmarket Holidays is the perfect choice for those who want to get away from it all during the Christmas Season. The price includes a four-night stay in a beautiful hotel, which is located close to the famously scenic ‘German Riviera’ shore, half-board accommodation (with a number of delicious, festive meals), and a programme of fascinating tours and activities. The trip begins with a flight to Zurich, after which you will be transferred to your hotel. The festive-themed programme includes traditional gingerbread and gluhwein on Christmas Eve, as well as a hearty lunch and a decadent feast on Christmas Day. Throughout the course of your break, a tour manager from Newmarket Holidays will be available; they can serve as a tour guide as you stroll around the stunning lake area, and during your visits to Meersburg, a medieval town, and Minaau, the ‘flower island’, where you’ll find the Butterfly House and the wintry parkland. There will also be an opportunity to visit Lindau, an idyllic island town, which is considered to be one of the greatest treasures of southern Germany. The final optional excursion is a trip into Vorarlberg, an Austrian region famed for its picture-perfect scenery. During this tour, you will get to admire the beauty of the local area, from a cable car, before returning to your hotel, via Bodensee. The Hotel Fohr, where you will stay, is just two hundred metres from the shores of Lake Constance, and is also conveniently close to the town centre. Combining German hospitality with modern amenities, the hotel is warm and welcoming. Offering rooms with telephones, mini-bars, and cable television, the hotel also has a charming restaurant that serves a combination of sophisticated international dishes and hearty local cuisine. This break offers excellent value for money, and so is ideal for those who are on a tight budget but want to treat themselves to a holiday over the Christmas period. The total price is inclusive of the services of the tour manager, transfers to and from the hotel, return flights to and from Zurich, one night of full-board accommodation, and three nights of half-board, as well as a two-course lunch and a five-course supper on Christmas Day. 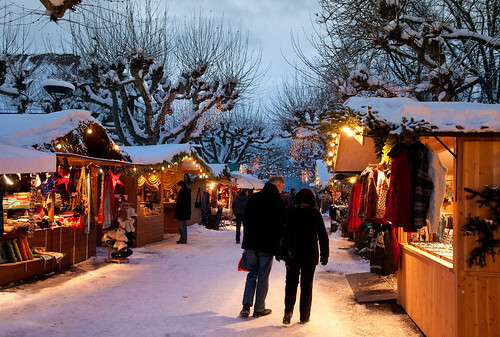 In addition to this, it also includes trips to the aforementioned islands of Lindau and Mainau, as well as the gingerbread and Gluhwein that will be served on Christmas Eve. This entry was posted in Affordable Getaway, Exotic Destinations, Holiday, holiday experience, Newmarket Group, Newmarket Holidays and tagged 'German Riviera' shore, best holiday options, Christmas holidays, festive visit to Lake Constance, Newmarket Holidays on September 26, 2013 by Editor.